Introduction to The Brayshaw Collection at Giggleswick School. 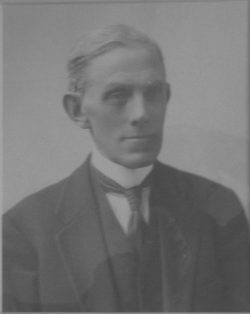 Thomas Brayshaw (1854 – 1931) was a solicitor living in Stackhouse who was a local historian. For more than 40 years he was the recognized authority in matters of local historical interest. He was closely associated with Giggleswick School from being a pupil to being Governor over a period of 60 years. In Giggleswick School Brayshaw Library within the general Brayshaw Collection are four large volumes of about 400 pages each entitled ‘‘On foot round Settle’, Brown’. These volumes contain printed pages taken from George H. Brown’s book On foot round Settle published in Settle by J. W. Lambert in 1896 to which have been added a large number of items of relevance – newspaper cuttings, photographs, postcards, maps, records of church events, voting papers, subscription appeals, school and education items, caving literature, etc. Each page of these four volumes and the contents of any folded inserted item have been scanned and are presented in order of scanning. The actual page number in a book if not seen on a scan may have to be estimated by looking at nearby images for purposes of location in any one volume. Brayshaw also created seven volumes of WW1 items of about 100 pages each plus many inserted loose papers. These have also been scanned. The collection includes many large posters. They are not in page order but since the items are pasted in more or less at random and sometimes overlapping this is not of significance. As with the four volumes based on Brown’s book it has not been possible to obtain perfect images or to give location page numbers. A detailed cataloguing has not been attempted since a page may have many disparate items; a general overall description of items is provided instead. The quality of some of the images is moderate since the strong binding prevents the pages being flattened adequately for photography. Rather the images should be considered a visual catalogue and if a better image is required then the original books have to be inspected. Volume 4 has more items on local places and caves and specific Thomas Brayshaw items. and the seven further volumes are all about World War 1. We are indebted to the school authorities for permission to allow copying of the volumes and the Archivist Mrs Barbara Gent and Librarian Mrs Linda Evans for their help and enthusiasm in carrying out the work of scanning and putting images on the website. A catalogue of all items in the Brayshaw Library can be seen on application to the school Archivist. The images are subject to copyright restrictions.